Banyumas, of course familiar, Banyumas regency, Central Java (Central Java) has one Baturaden tourist attraction. The particular nature are felt from the forest, crystal clear river, until the campsite (camping ground). However, Banyumas not only has Baturaden. In Sub Cilongok or about 15 km west of Purwokerto, also has a tourist attraction similar to Baturaden. Sensational charm, because the typical natural mountains can really be enjoyed by visitors. That waterfall and lake Cipendok Pucung. 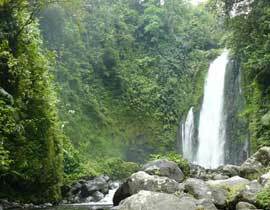 If you want to visit the waterfall Cipendok, be prepared to bring an umbrella or raincoat, and clothes. Because if you enter the waterfall area Cipendok, you must have "rain". This is because Cipendok waterfall is a waterfall that has a height of almost 100 meters, so that water droplets wetting the surrounding area, although no rain. 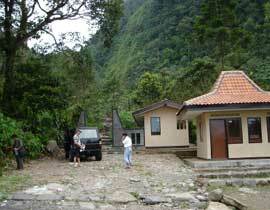 Curug Cipendok become the main attraction, because of its natural environment are truly natural. The silence is still deeply felt, because not many travelers who come to enjoy the natural beauty Karangtengah Village, District Cilongok. Between Curug Cipendok with the car park about 500 meters remaining. But do not worry, travel 500 meters from the entrance road to the waterfall is not going to make bored. On the contrary, the trip brought a visitor into nature that are still beautiful. With the road up and down, tourists who come will be greeted with the sounds of insects typical tropical forest. After walking about 15-20 minutes, prior to Curug Cipendok roar will sound like heavy rain. That sounds a waterfall coming down from a height of nearly 100 meter. The cool air coupled with water droplets create a peaceful atmosphere and fresh. If it was already daylight, the sun shines make the results reflected a thin rainbow water droplets that fall. Towards Curug Cipendok is not too difficult. However, there has been no official public transportation to get there, so that when tourists visit the place it should be by private vehicle or rental. Natural attractions, located about 10 km west ofPurwokerto, or about 5 km from Ajibarang, Banyumas. From the highway Cilongok to the location is 8 km with the condition rose and winding road, but the asphalt was smooth. Cipendok waterfall nearby, there are also tour the lake is absolutely stunning Lake Pucung. Local lake surrounded by pine woods and resin, so it is suitable for camping ground. This lake will be one of the mainstay Banyumas to siphon tourist. Pucung Lake Complex occupies an area of three hectares (ha), with an area of about one hectare lake. Tourist attraction in Banyumas may not have much to know, because it will be opened officially become a tourist destination on August 8, 2005. This tourist attraction is the lake with enough water in the surrounding clear and surrounded by natural forest. In addition, visitors can also hear the sounds of rare birds such as the Javanese eagle circling above the lake. Moreover, for the lucky visitors can see a kind of endemic species of monkey that is grayed out, rek-rek. Attractions included in the road was widened Unity Forest Pemangkuan (KPH) East Banyuma the start addressed by a variety of facilities, due to officially become a tourist destination. KPH East Banyumas has equipped with parking, rest areas, and bathrooms. In fact, Perhutani have given the names of rare trees that live there. Another goal is not designed for students, in addition to enjoying the outdoors, they also can recognize the rare plants that live in that place. Around the lake there is also Pucung airy place that can be used for camping ground. The place is intentionally created, reserved for young children who like to adventure with in the wild. 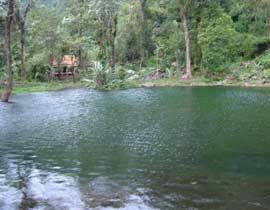 It has established Lake Pucung Banyumas the typical tourist nature of the mountains. With increasing tourist attraction, the tourists who come to the mendambah Banyumas alternative list of tourist destinations. So, if you've been to just go to Baturaden Banyumas, will lose. The reason is, there are still other alternative places are no less asrinya. To be sure, tourists who come to this place will feel peace, because it is far from the urban bustle.